ANAHEIM, Calif. — August 3, 2017 — Rollem International, a leader in print finishing, converting and diecutting technology is planning their most diverse selection of collaborative finishing solutions ever exhibited. The Jetslit with Bourg Feeder from Rollem. The Coat & Cut demonstration has a broad range of appeal for printers who require UV coating of their press sheets. The TEC Lighting UV coater will feed and UV coat a menu application which is handed off in-line to the Rollem Jetstream for edge trims and scoring – all in one process. The benefit of this configuration includes the elimination of stock movement, less manpower and increased production times. “Our collaboration with TEC Lighting, is one of the many valuable equipment integrations we are excited to share with the Print ’17 attendees”, states Susan Corwin, Marketing Manager. This demonstration addresses the opportunities for printers to expand into the growing packaging segment by offering their customers affordable, high quality custom diecutting. 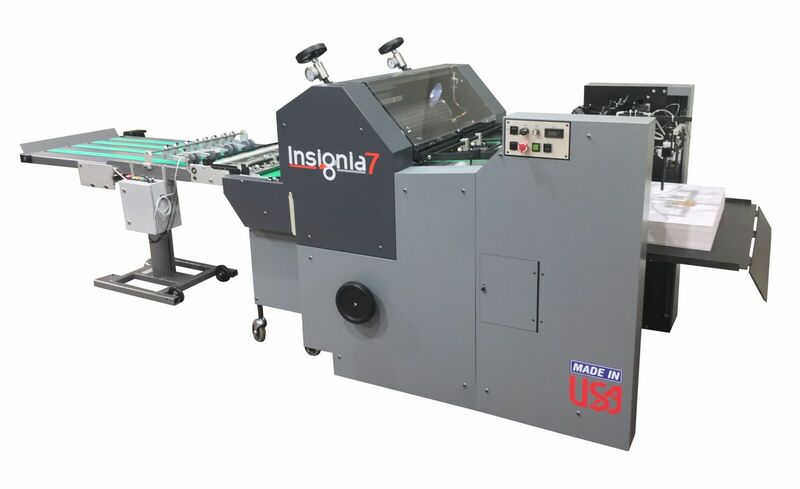 The Insignia 7 larger format diecutter will be shown for the first time. This flexo-magnetic, diecutter offers the largest sheet size in its class with a 30x24” capacity along with industry leading 30 pt. capabilities, ideal for finishing output from offset and HP Indigo 10000 and 30000 presses. Visitors will see various applications including 8-up diecut & kiss cut gift tag sheets and kiss-cut label sheets. Rollem is known for providing slitting systems to many of the world’s top web-to-print companies and now visitors will have the opportunity to mirror those finishing systems. This demonstration further automates the Jetstream XY bi-directional slit, score, and perf system with sheet feeding from the C.P. Bourg BSF system. No transfer of heavy stock is necessary as multiple loaded trolleys feed the Jetstream, resulting in increased productivity, no damaged sheets, and less risk of injuries. This demo shows a 36-up sheet of business cards as they are edge trimmed, slit, turned, edge trimmed, slit and delivered into 100% accurate stacks at speeds up to 100,000 cards per hour! The Insignia 7 from Rollem. The Insignia 6 flexo-magnetic diecutter offers easy operation and fast changeovers for short to long runs with a wealth of production capabilities. Diecut, kiss cut, score and emboss with this flexible format diecutter. The IS6 was designed with a 20x20” sheet capacity, allowing sheets to be fed from either the landscape or portrait direction, which maximizes sheets impositions for greater savings. Print 17 visitors will see various applications including diecutting, kiss-cutting, and scoring of presentation folders along with popular plastic insurance ID card carriers printed on 30 pt. stock. The ID card is kiss-cut within the carrier for easy handling and mailing. Rollem is introducing its new Ink-Jet Finishing system featuring the Jet Tower solution with a shallow pile suction feed Slitting, Scoring and Perforating system. It’s the ideal system for simultaneous ink jetting of variable data information and in-line finishing. In this demonstration, a ballot application with variable name and numbers are applied and the individual pieces are perforated within the master sheet. This is the most economical method for lower to mid volume ink-jetting and in-line finishing. The Jetstream+Auto-Collator, automated XY Cutter/Collator efficiently and economically converts multiple-up products in to sets. Sheets are trimmed, slit, scored, perforated and cut, all in one pass. 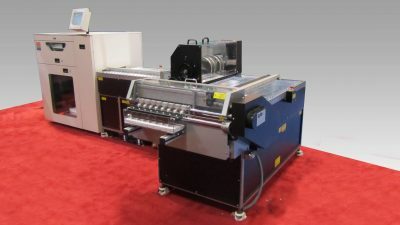 Eliminates guillotine cutting and increases production while delivering superior slitting accuracy. Produce playing cards, game cards, retail shelf tags, business cards, or rewards cards. Visitors are invited to pick up a collector’s pack of Rollem antique reproduction playing card decks printed on a HP 10000 press. Known for a high degree of accuracy and dependability, Rollem delivers the finest finishing equipment your clients demand with less labor and greater automation and integration with other devices. See these and other print finishing systems at Print ’17, September 10-14, Chicago, IL, Booth #845.